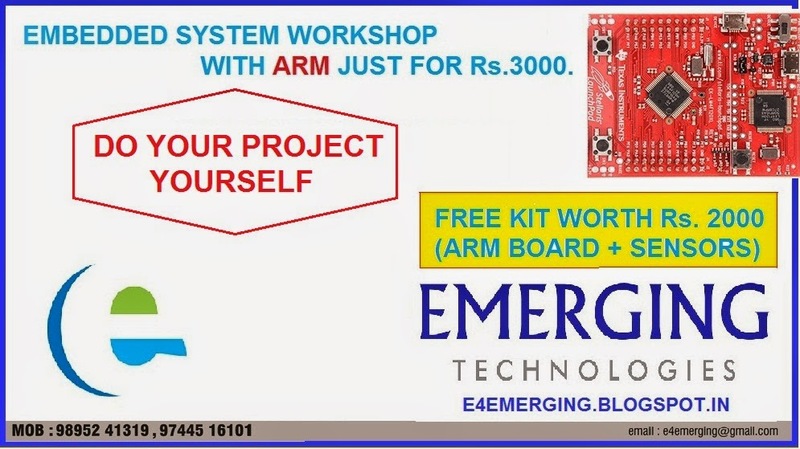 Dear friends do your project yourself to understand that you can control the world with embedded system.This is powerful arm chip from texas instrunments and language for programming is very simple one. This course is designed to give engineering students and professionals an in-depth knowledge of microcontroller programming, embedded application design and Robotics. This course is designed keeping in mind the challenging industry standards and the need for practical learning for engineering students. This program will introduce the participants to various aspects of embedded programming, application development and implementation. The hardware and software used is completely new and it is from Texas Instruments. This provides a good industry exposure to the participants as already adopted in their curriculum. In addition to the learning, each participant will be certified thus increasing their chances of placing themselves in industries and pursue research in the fields of their choice.